For years sock knitting mystified me. You’re heard the argument before; why would you spend so much effort, thousands of tiny stitches, expensive hand-dyed yarn, and countless hours, why would you combine all those things and put the results on your feet? To answer the question, all you’ve got to do is dedicate enough time to knit yourself a pair, just one pair. Even better, knit someone else a pair. Because hand-knit socks feel like heaven on your feet and fit like nothing that you’ll ever buy in a store. And gifted hand-knit socks? There’s nothing better! When my mom put these on she immediately started gushing about how comfortable and warm they were. She loves them so much, that when I was only half way through she insisted on wearing her singular sock around the house. That level of delight is enough to inspire a daughter to knit many, many more pairs of socks (even if mom does want her next pair to be all black). 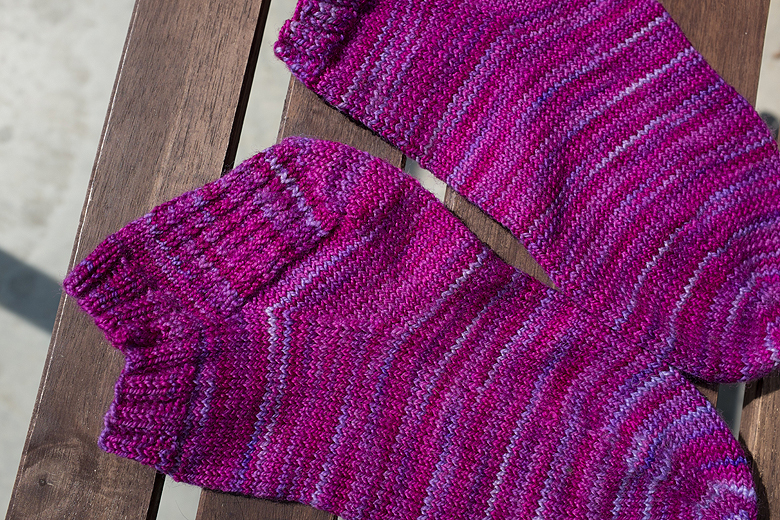 If you are new to sock knitting, and looking to see what the rest of us are raving about, I totally recommend the pattern Shireen, designed by Rayna. While I confess that I’m a little biased (you know, because Ray is the best sock knitter EVER (ok, maybe more than a little biased)) I can also tell you that this is a great beginner pattern because it’s easy to follow, straight-forward stockinette and it’s an ankle sock, which means that you work only a little bit of leg before getting into the fun part. After that it’s a cruise down the foot, and before you know it you’re done. Best of all, these socks take only one skein of koigu for the small size, and you can get a pair of large sized ones out of a single skein of Rhichard Devrieze. Have I sold you yet? Who doesn’t have a gorgeous, variegated single 50g skein of lonely sock yarn? 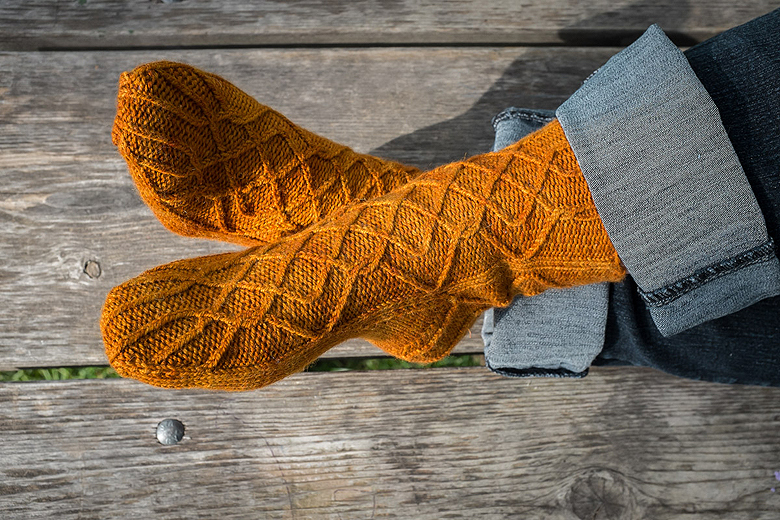 And for the more experienced sock knitters out there, Rayna just released a new pattern called Signal Hill and it’s next up on my list for socks. It features gorgeous cables down the front, and it’s written for DK weight yarn. Mmm…. 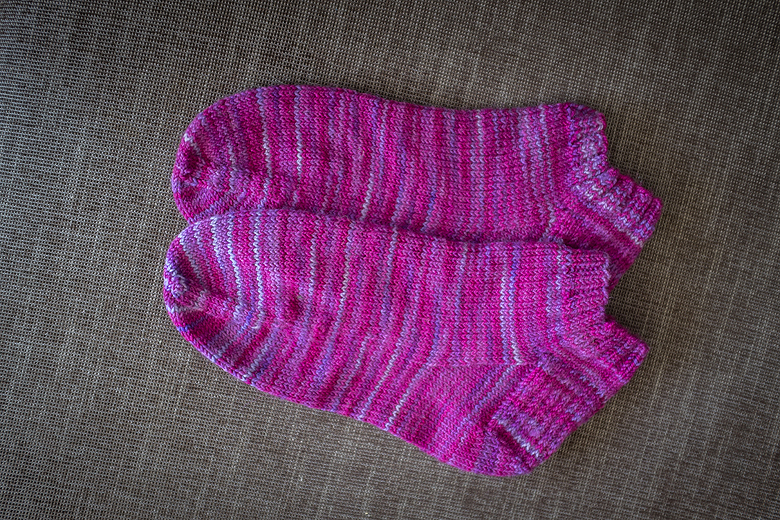 DK weight socks… winter is coming! One year I made 100 pair of socks. Knee length. Then I made about 20 ankle socks and put a fringe around the ankle in a fuzzy contrast yarn. Now don’t go raising your eyebrows like that Shireen – I made them flat – on my knitting machines – but I sewed them all up by hand. I did turn the heels and toes on the machine through short-rowing and then used open-stitches cast-off so that I could weave the stitches together when I sewed them up. I’ve sold all of them now. The thing is – people do love a sock like that. Even a machine knit sock that is like a hand knit sock. People could not tell the difference because it wore on the foot like a hand knit sock. What people love about a hand knit sock is no elastic in the ribbing I think. 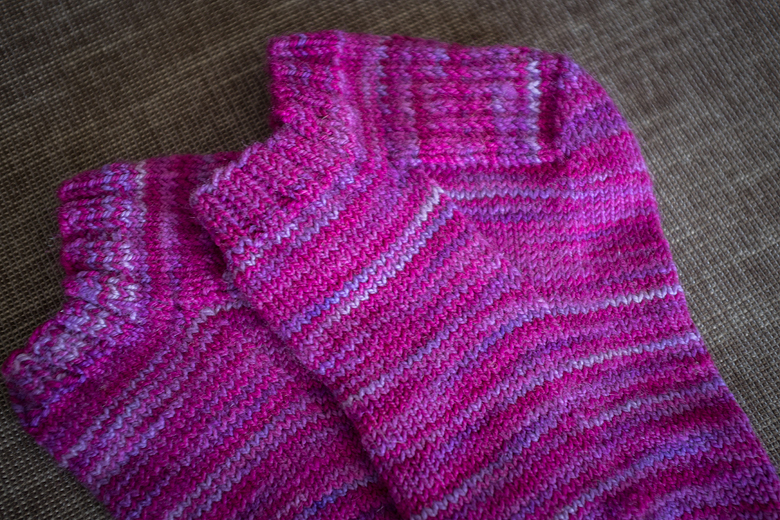 A hand knit sock doesn’t cut off circulation around the ankle or calf. Gladerider – Do you know, for the longest time when you posted a commend I read it as ‘gladiator crafts’ ? Too funny, and now that I think of it, I love that name!